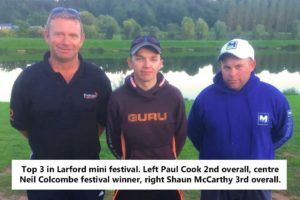 Winner on the final day of this 4 day festival was Neil Colcombe (Larford) who caught a massive 215-04-00 from peg 25 on the Match Lake grass bank. Neil caught on banded pellet at 6m, later switching to 13m landing mainly F1 carp. When he switched to his edge it was game over landing quality carp from his edges. 2nd on the day was Paul Cook ( Frenzee) 202-13-00 from peg 54. Paul caught short on pellet and later down his edge. 3rd Shaun McCarthy (Mossella) with 177-13-00 from peg 45. Shaun caught on hard pellet short and down his edge. 4th on the day was Ray Lamb (Larford) who drew peg 10. 5th on the day was Darren Hudson (PR Floats) who drew 57 peg. 6th on the day was Harry Harris ( Larford) who drew peg 60. Harry caught most of his fish down his edge weighing 148-14-00.